Are you running the store with a large catalog of products? Wanna bring store usability to new high level? Templates-Master offers you to try free extension Easy Catalog Images 2.0 to make the display of categories' list more presentable. Grab users attention on your store page, providing them with the immediate loadable subcategories' listing on the homepage.The default Magento drop down menu doesn’t provide a user-friendly way to browse stores with large catalogs. Our extension allows you to use better navigation displaying all subcategories' list on the category page. 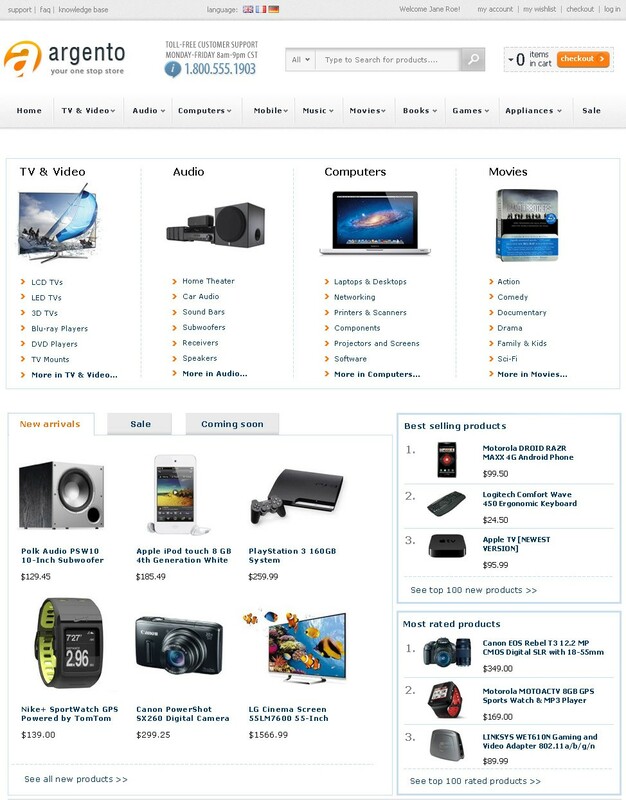 You can also add a category listing using Magento widget on any store page according to your requirements. Find out more information and reviews about our module at Magento Categories Images extension page. While looking for new products, customers commonly choose from product categories displayed on the homepage. Therefore, we are pleased to offer something more visual in order to encourage them to click. The best way to introduce the wide range of your store products is to display subcategories' block. Easy Catalog Images will help you to place it in Magento using widgets, xml code and default block code. It allows you to place a subcategories listing alongside current top level categories. 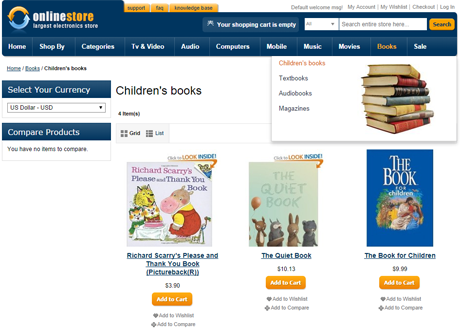 Easy Catalog Images extension allows you to show already assigned categories images and child categories images on the homepage and on the category page. Please notice, if you assign the image to the category, it will be displayed both on the Easy Catalog Images pages and on the category page of your web-store. 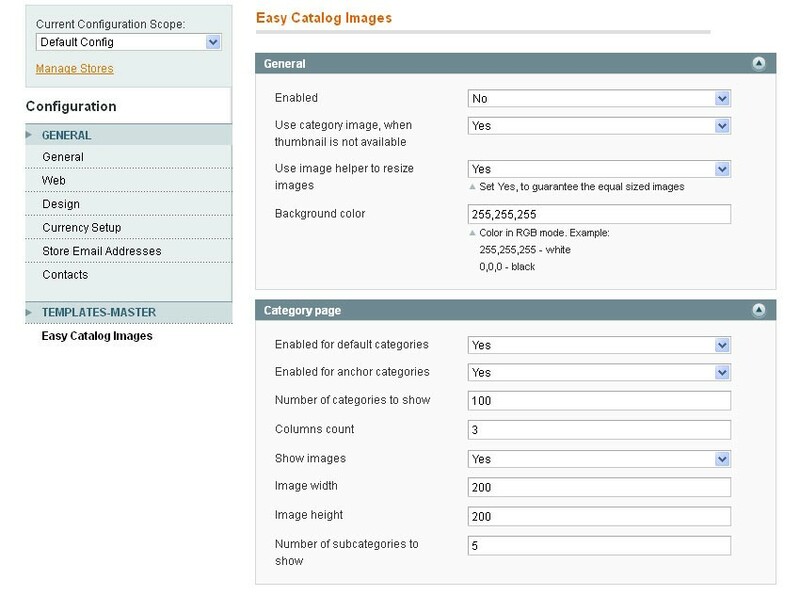 So, we offer you to assign categories images to the thumbnail field in order to show all categories' images only in the Easy Catalog Images list block. For better user experience our extension allows to resize image, and to specify the width and the height attributes of the categories' images. Easy Catalog Images will help you to create category listings by using Magento widgets on any store page according to your requirements. 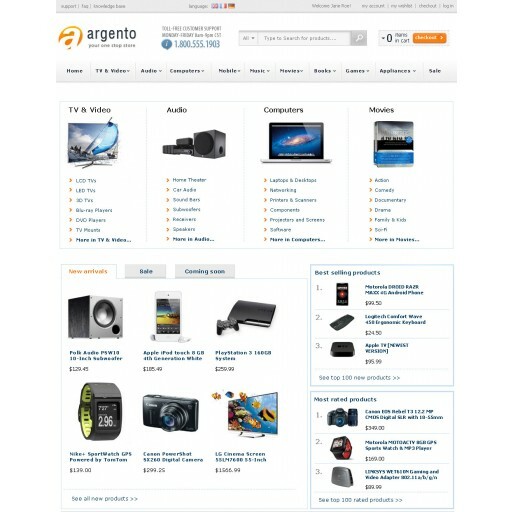 We recommend to use widgets to improve the performance and functionality of your Magento web-store. By using Easy catalog images widgets and Navigation Pro, you can set up a menu with a magento list of categories and images. Parameters of the widget can be configured in order to help you to customize the menu. You can select the number of current categories and sub-categories to be displayed, for instance. You can also specify the size of the image to be released, and the columns count. Easy Catalog Images module allows you to add more keywords and links to the category page and also to the magento subcategory grid. It will surely improve your web-site SEO and save users' time. SEO optimized landing pages will give you better sales conversion. Moreover, you'll increase internet search ranking of your website. We do understand that every store has a different category tree and each category can have a different number of subcategories. That could cause problems related to formatting the list of subcategories. So, we have added a config option in order to limit the number of maximum subcategories listed below the parent category. Such option allows to create professional looking magento category list blocks. Product worked as advertised. Awesome customer service. Assisted with the installation. 100% professional. Awesome customer service. Assisted with the installation. 100% professional. Works perfectly, would like the option of putting images below content on category pages. This extension was a terrific catch! It did exactly what we needed and was a combination of several of our needs all in one! We will certainly look towards Template Master in the future to fill our Magento extension needs! This extension did exactly what i wanted and the support was great!! Installed it and it didn't worked, so i contacted the developer and they gave me great support! And now it works really fine! This extension does great as advertised, but also provides a nice simple helper class to re-size any image including category images the same as product images can. The only hangup with it is that if you have a CDN using the sub-domain "media", a string matching function that it uses will match on the domain instead of file path resulting in a 404 error at the expected file path. Works on both CE and EE. I am very happy with this extension. They given good support for installation and also they designed according to my theme compatability. In my Opinion I can recommed this Template Monster team to every one. This is something I have been looking for, but could not find it. Incredibly useful, and easy to customise. Whether you implement it to work automatically or via a widget. And I was really amazed by the support I got. Truly outstanding. I could not get it to work right away, but got a response almost right away. In the end I think I messed up something, but they fixed it in no time. And all this for a free extension! Hats off for an excellent tool and an awesome support team. Very useful, saved me a lot of work. Our shop has a lot of categories and subcategories. without this product i had to make all the categories and subcategories including a picture. Now the actualy work (installing) cost me 30 minutes (i am a noob). And that all for FREE !!!! This extensions is great, I made a suggestion to the developer, and they implemented it straight away and sent me the diff file. Could not ask for more! View all reviews for Magento Easy Catalog Images 2.0. Improved responsive styles for widget layouts with 3 and 5 columns. Added thumbnail attribute installation to prevent error in magento 1.9.1. Please rebuild catalog_category_flat index, if you still get error. Improved Automatic Image Assignment feature. 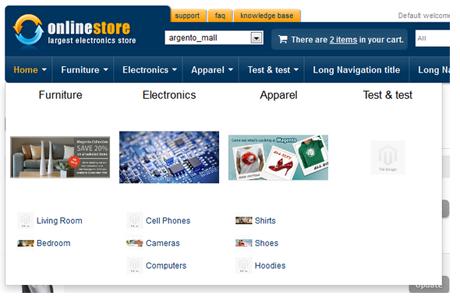 Now it can search for products from nested categories. Widget refactoring to fix the 'Hide, when filter is used' option. Use the easycatalogimg/widget_list type instead of easycatalogimg/list. Ability to hide block, when filter or pagination is applied. Ability to show widget on category pages, when category config is disabled. Perfomance improvements. Dramatically decreased query count per block render (One query). Flexible grid styles added to support multicolumn mode for various site styles without modifying the styles. 2-6 columns are supported out of the box. Category thumbnail is displayed instead of category image by default. EasyCatalogImages block is now shown above the category title. We did this to prevent numerous conflicts with custom themes. Maximum category count to show added. Ability to set the background color for resized image. White by default. 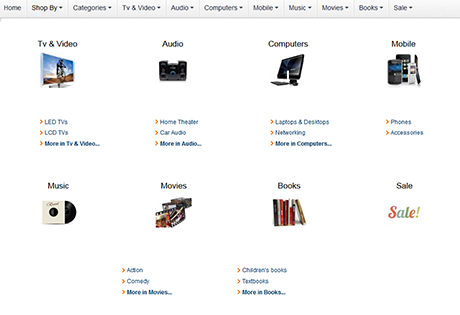 'Show categories listing' on homepage removed. Please use the homepage editor and add Easy Catalog Images widget directly to the homepage content. Ability to disable product listing removed. 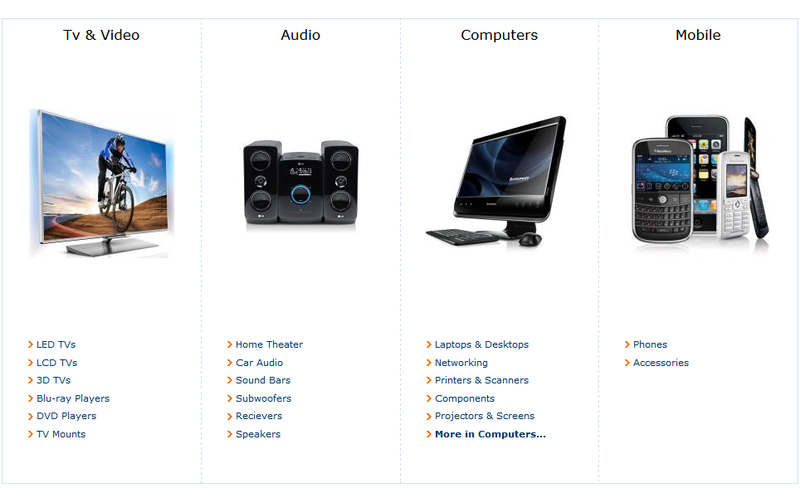 Please use the built-in Magento option on category edit page. 'Show child categories' field removed. Please use the 'Number of subcategories to show' field get the same result. Q: I've downloaded your extension via magentocommerce and I am using it on CE 1.7.0.2. Its works fine. Thanks for this function! Is it possible to display the category name and description before the listing of categories? How can I establish this? A: That can be done. Right now extension block is outputted to content container in easycatalogimages.xml. I would suggest you to put to category.products container and then at category/view.phtml your should call that block with childhtml method. A: Could you explain that, because i really don't get what you mean. A: I asked the same question and I contacted the support team and they replied back with a solution that worked perfectly!In order to change postion of extension block on category products page please open easycatalogimg.xml and find next code:Change to:Then please open appdesignfrontendYOURPACKAGEYOURTHEMEtemplatecatalogcategoryview.phtml and place next code:right after categories listing name:Note: I had to flush cache on my website for me to see the changes.Thanks again Support Team !!! Your support even on FREE products is amazing!!!! I've been your customer for the last 3 years and I'm definitely a lifetime customer. Q: Hello. How I can use that plugin only on Home? A: Sure, you can do that. You can simply insert that module as widget to your home page content. Q: How can I set the sort order of sub categories in alphabetical order? A: Sorry but that isn't possible with out extension customization. A: 1. Your theme is missing some core Magento classes. So you should add to categories li container float left style.2. I think it's done using css so you should copy same styles to categories listing container. Q: How do you get images to resize after editing the sizes in system configuration? I've reduced the setting for image height leaving the width alone. The images will not resize to the new setting even if I delete them from the category then add them again. A: Figured it out. I was using a widget and had to also alter the settings there. Deleted old files off server just in case and all is well. Q: How to display category images block in other place on category page? Q: Does it works with the images from sub categorys too ? A: No unfortunately for now only categories images are supported. Q: I can't get the subcategories to work. staging.redballoontoystore.com I saw that with the ultimo theme you need to copy the extension files to the package, I tried that, but still no go. Help please. 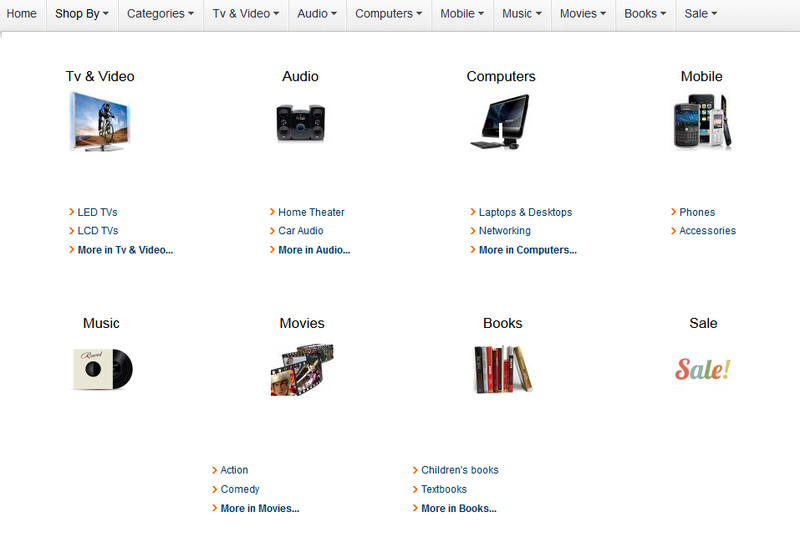 A: Sorry do you have problems with placing Easy catalog images widget on home page? A: Can you place link to your store so we can check what is wrong? Also have you enabled extension in extension configuration settings? Widget should be placed only for home page. Q: Hi, is it possible to have the catalog images only show for specific categories? i.e have the catalog images showing for category A, B but not for category C? A: It's only possible if you will add or remove this block with xml code for each category. There is no any configuration setting that allows to do that. Q: is there a way to Add Expires headers to the easy catalog images extension? A: Expires headers tag should be added using either Apach or Nginx server configuration. Q: Hi, I installed the extension (magento 1.7.0.2), enabled it, flashed and renew cash, log out. However nothing has happened, what is wrong with it? A: Please let us know link to your store. Q: Hi,Thanks for the great extension.Is it possible to configure this extension in a way that I can enable/disable it for specific categories/subcategories.Thanks! A: Sorry but that isn't possible in current release. But i can suggest you to remove our extension block using xml and Custom Layout Update setting for categories where you want to remove that block. Q: Hi, can you give me a few possible issues that could cause the extension to no longer be able to produce new resized images? it did work when first installed but not any more. A: Usually there is issue with write permissions for categories images media folder. Please check that issue first and then if you have enough place on your server. Q: Catalog images appear above main content - I installed this extension and I am very happy that it worked the first time! However, the catalog images are appearing above my "Home" page content (including the content and the right column) Does anyone know how to get it to show up inside the main content div?Screenshot: http://puu.sh/wp9tThanks! A: Sorry but that isn't possible right out of the box. You can only list all categories and exclude categories that you don't want to be listed. A: Please contact our support at http://templates-master.com/helpdesk so we can check that issue. Q: Hi,I've installed the extension at this link: http://persiandise.com/art But the categories are not in rows, instead they're in one column. Please help me on how to fix this issue.Thanks! A: You should copy extension files into your ultimo package in order to use our extension with that theme. Improve your store sales! Allows clients make a purchase faster and easier by providing them a simple checkout page. Supports all major payment and shipping methods.